We often look at 40K Lore, but today we are going to delve deeper into the history of the realm of Fantasy Battles - Welcome to Lustria! While many people think of the typical medieval, european setting when Warhammer Fantasy is mentioned there are actually a wealth of other settings that occupy that world. Far across the Great Ocean lies the sweltering jungles of Lustria and the mysterious denizens who make it home. Although it may seem inhospitable to many there are actually several races who dwell within its' borders, chief amongst them the Lizardmen. In the beginning the world consisted of harsh extremes barely able to sustain life. A single massive mega-continent dominated the ocean and what lifeforms did exist were a far cry from even the Elves or Dwarfs, who are considered amongst the most venerable races. Then from the heavens came the Old Ones, an ancient space faring race, for reasons unknown to any this world suited their plans, although not in the state they found it. Using their vast power they moved the planet closer to the sun and separated the lands into a form more pleasing to them. They were not alone in their endeavor as they had brought their most favored servants, the Slann, with them. The sweltering jungles of Lustria suited them so they built the capital of their new world there and set up cities as far afield as the Southlands and Cathay. 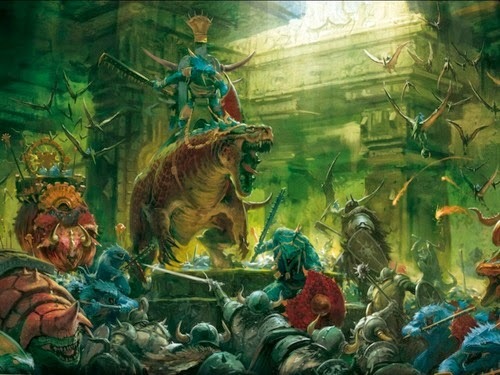 Knowing that the Slann were not enough to pacify the entirety of the world they created the first Saurus to act as their warriors. Entire races were exterminated who did not fit into the Old Ones' plans. Next came the Skinks to be their scribes and ambassadors and the Kroxigors to be their laborers. For millennia the Old Ones and their Lizardman servants were the undisputed rulers of the world, guiding events to suite their needs. All was not well for long though as an ancient enemy appeared in the world, a force which would later be called Chaos. The Old Ones fought the forces of Chaos for centuries, each trying to gain control over the interstellar gates which hung over the poles. Eventually the gates exploded, whether due to the overwhelming energies of Chaos or through some self sacrificing ploy of the Old Ones is unknown. All that is known is that with this act the Old Ones disappeared and Chaos was left to run rampant across the globe. The Slann cut off from their masters began to formulate a plan and retreated to the remaining Lizardman cities that weren't destroyed in the explosion. 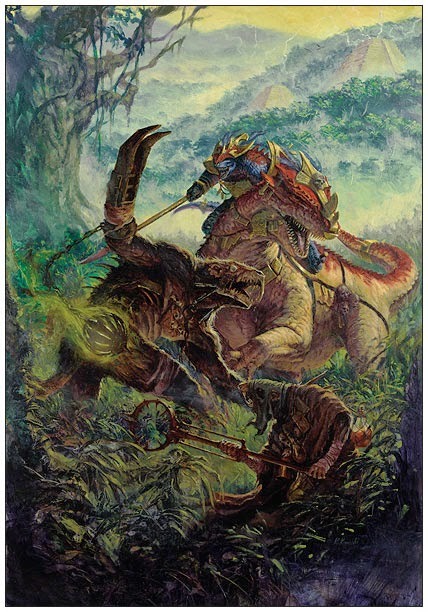 Many battles were fought throughout the jungles with the Saurus warriors attempting to push the Demons of Chaos back. In these times many cities were lost and hero's legends were written such as Lord Kroak and Kroq-Gar as the denizens of Lustria strived to hold onto what they had left. 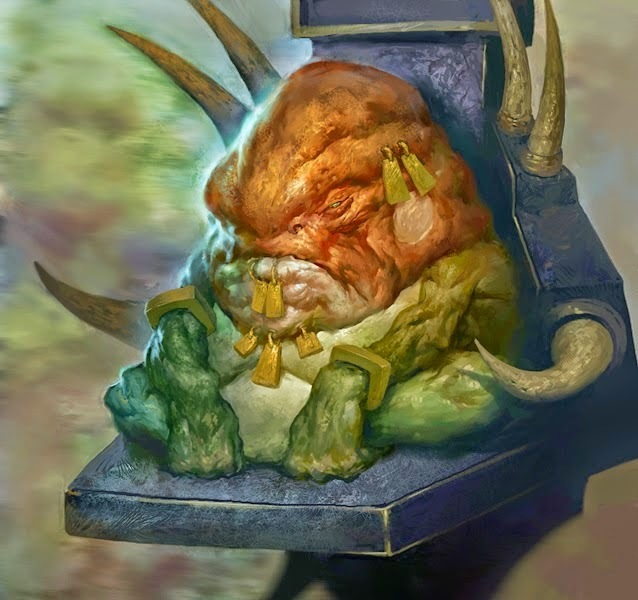 Sensing that they could not prevail in helping the rest of the world and its races the Slann focused solely on defending their realms. Luckily for them the Elves of Ulthuan had been taught well in the ways of magic and were able to create a spell which abolished much of the winds of magic which allowed the Demons to exist on the mortal realm. With the spell successful the forces of Chaos were constrained to the north and south poles, although at a terrible cost to the Elves, whose mages were destined for an eternity of torment for their sacrifice. With the forces of Chaos contained the Slann turned their attention back to continuing the Great Plan laid down for them by the Old Ones. 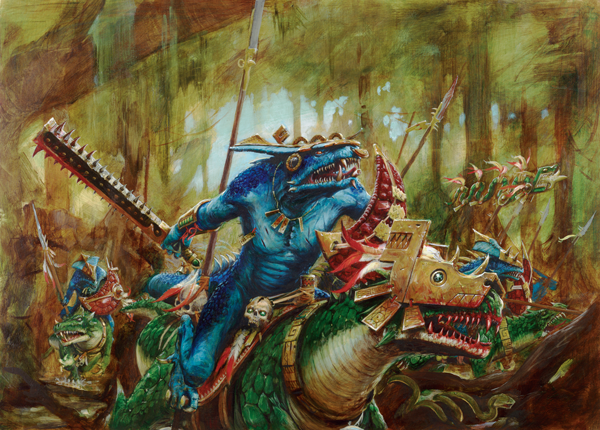 For thousands of years afterward the Lizardmen lived in isolation, occasionally interrupted by a Chaos incursion as their power grew to great for the Slann to contain. The next great invasion of Lustria was by the Skaven of Clan Pestilens who took up residence in the Temple City of Quetza. For thousands of years they fought with the natives, easily spreading disease and pestilence in the humid jungles. When the twin tailed comet streaked across the skies the priests took it as a sign of the snake god Sotek, with his forked tongue, bestowing favor upon them. 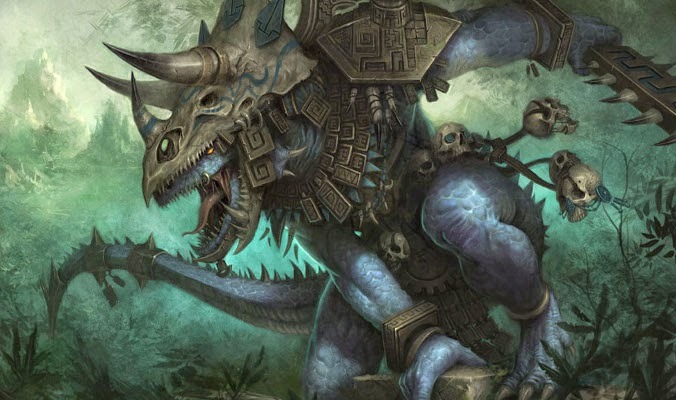 With the cult of Sotek in ascendence the Lizardmen were able to drive the Skaven out of Quetza and Lustria by sending thousands of snakes down into the tunnels. When the Dark Elves began sending raids down into the jungle it spawned a distrust of all warm blooded creatures, since the Lizardmen did not differentiate between the Dark and High Elves and saw this as a betrayal from a trusted ally. Man began to explore Lustria very slowly over the centuries, starting with the Norse and later the Tileans and the Empire. Since the rise of man was foretold and part of the Great Plan they were left alone for the most part unless the delved to deep and greedily into the jungle. After the battle for Albion the Slann have decided that now is the time to correct all of the abnormalities that have arisen within the Great Plan and for the first time in millennia have begun to take a more active role in the world as a whole. Lustria itself is in essence a gigantic jungle that covers an entire continent. The vegetation is so thick that sky is all but blocked out and the jungle floor crawls with lethal insects. Every plant is deadly and even the mud itself is laced with toxins lethal to human life. If one is able to penetrate further enough inland they will eventually find vast, sprawling temple cities that lay in ruins, all but abandoned, or if they find one still teeming with life they won't live long enough to tell their tale. 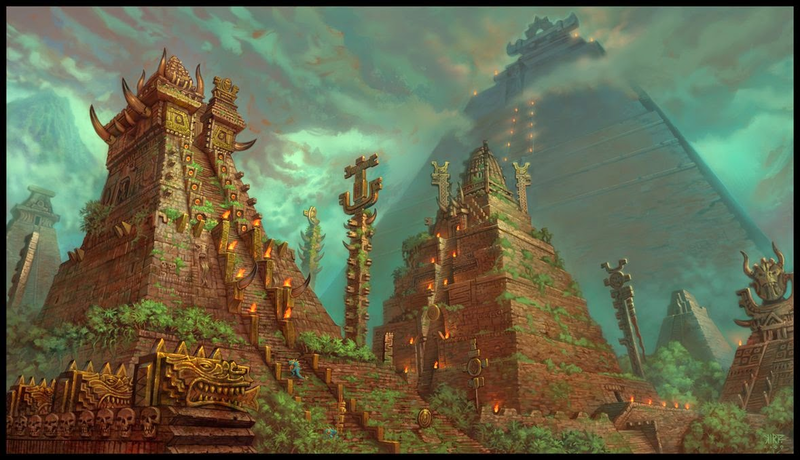 Itza is the oldest of the Lizardmen's Temple Cities and home to Lord Kroak, it is the de facto capital of their empire although it is unsure if such a concept even exists for them. During the first great invasion of Chaos the Demon horde was only stopped by Lord Kroak's sacrifice when he unleashed a spell so powerful it banished all of Demons and wiped all other spells from his mind. Although he was killed his spirit was anchored to his body and continued to fight, as it still does today. Pahuax lies just south of Hexatol, the northern most city of Lustria. During the Great Catastrophe Lord Pocaxalan attempted to banish all the demons assailing the city in a similar manner to Lord Kroak. Unfortunately the spell spiraled out of his control and the entire was city and a large swathe of the surrounding area was suddenly aged thousands of years in a matter of moments. All of its inhabitants and most of its building crumbled into ash and dust. The venerable Slann and his entire inner sanctum was sucked into the Realm of Chaos where he was torn apart. 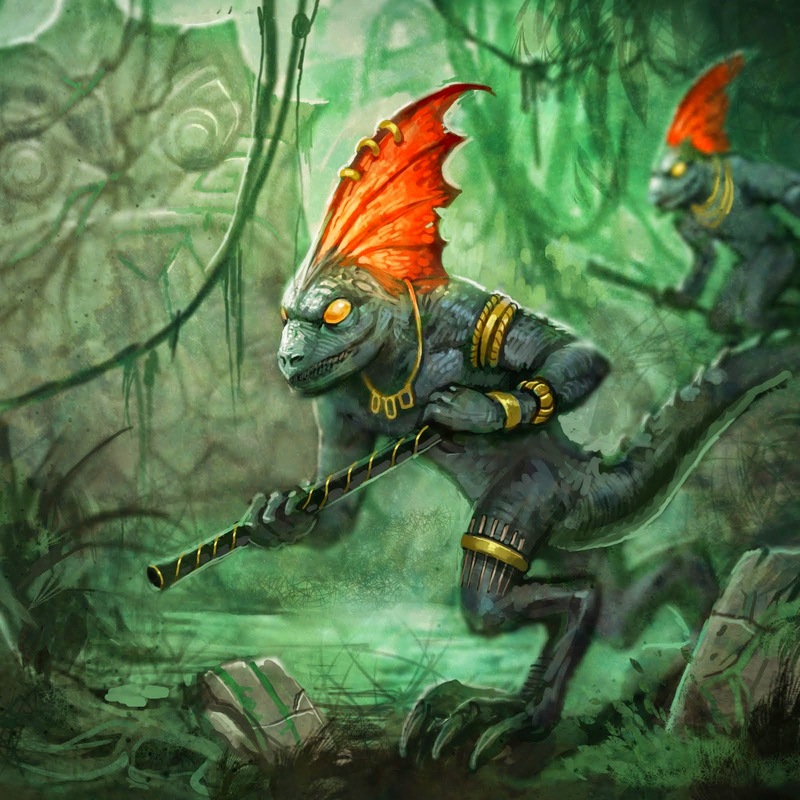 Before this event Pahuax was the only city that spawned Chameleon Skinks and for thousands of years they were thought extinct. However recently Oxyotl, a Chameleon Skink who had protected Lord Pocaxalan during his great folly, has returned to Lustria from the Realm of Chaos. His arrival has coincided with the largest and only spawning of Chameleon Skinks since the Great Catastrophe. This Temple City lies to the far north of Lustria and acts as a bulwark against invaders from Naggorath and beyond. Although not as important as Itza it is by far the most heavily defended city and most active concerning events outside of Lustria. It is home to Lord Mazdamundi, the most active of the Slanns and a former pupil of Lord Kroak. In the year -1500 he altered the alignment of the world's land masses to better suit the Great Plan. As a side effect the World's Edge Mountains were wracked with earthquakes which decimated the Dwarven empire and set it towards its decline. Before the Great Catastrophe this city was renown for its astromancy and its ability to predict future events from the stars. After the polar gates collapsed a second moon was born in the sky made entirely of Warp stone (yeah thats right, the Warhammer world has a second moon which glows green, its pretty sweet). Since this moon was infused with the powers of Chaos and didn't follow the laws of physics it has disrupted their work. The Slann of Tlaxtlan have bent all of their will to moving the second moon from its orbit so that their power returns. So far they have been unsuccessful and have become distracted by outside events of late. This Temple City began to slip into the sea after the Great Catastrophe and finally succumbed to waters several thousand years later. All of its inhabitants fled to other cities although rumors talk about an undersea race taken up residence within the sunken city. The Vampire Coast was formed on accident when a Norse ship that was unwittingly carrying a coffin belonging to the Vampire Lord Luthor Harkon was shipwrecked on its shores. By the time the ships hit land all of its crew were already dead and under the Vampire's control. He has since grown his small empire by luring other ships to their doom upon the rocks and raising the crews from the deeps. The Lizardmen don't take kindly to the dead and have clashed with him several times but have been unable to dislodge him. After raising a particularly large horde Harkon went south and sacked the city of Axlotl, making off with many of its magical items. Skeggi is a trading port first established by the Norse when there ships were blown off course. Losteriksson lead this expedition and lost most of his crew to the harsh environment. Despite this within a decade the town was established and named after his daughter, the first Norse to be born in Lustria. The Lizardmen leave them alone for the most part as they tend to keep to themselves. This port was first built by the exiled Pirate Prince of Sartosa, Lucciano Soprania. It quickly evolved into a bustling trading port home to pirates and cut throats. Swamp Town was founded by a group of gamblers fleeing their debt in Port Reaver. Although its origins are as a small shanty town it is now the largest and busiest port in the New World, often acting as the gateway for explorers and adventurers from the Old World. Although not part of Lustria, the Southlands lay under the domain of the Lizardmen. These jungles lay to the south of Nehekhara and Araby and are home to five Temple Cities. Due to some fluke in the Great Plan, spawning of Saurus are very rare here, and those that are born are usually destined to be Temple Guard. 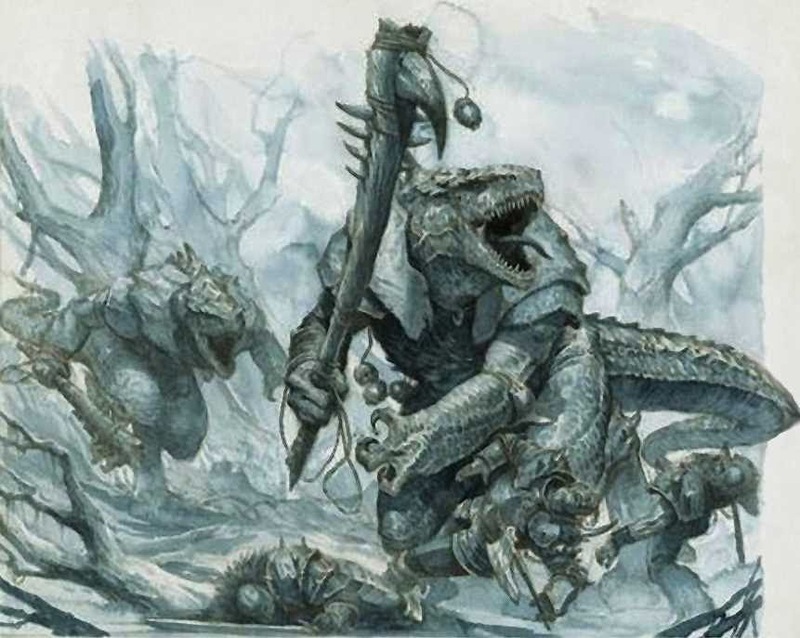 Since the Saurus is rare here the Skinks have had to take up the role of the warrior. Communication through the Southlands and Lustria are rare, part of this may be due to the relative youth of the Slann who call it home. They are only several thousand years old as opposed to several tens of thousands of years old. The latest addition to the Lizardmen empire is the island of Albion. This island was once a bastion of the Old Ones and remained shrouded in mists to protect it from the attention of outsiders. When the Dark Master started to gather power there and consequentially brought man, elf and dwarf there the Slann saw that they had to intervene. Opening a portal, Kroq-Gar led a great warhost though and cleared the island of all its warm blooded invaders. 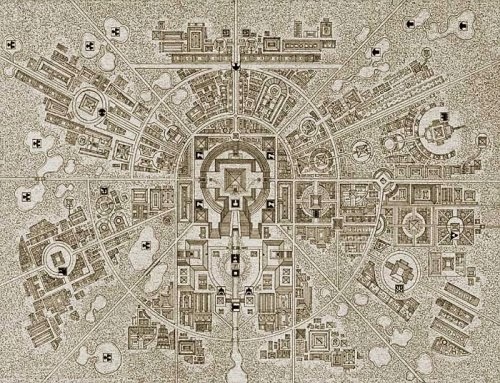 With it reclaimed for the Great Plan the Slann began to alter the environment there and its is now a teeming jungle just like Lustria, it even has a brand new Temple City on it to act as a launching point closer to the Old World incase they need to intervene. This is only the tip of the iceberg for Lustria as it has several army books, novels and decades of lore to draw from. If you want to learn more about this dense jungle and its denizens I recommend picking up the army book or for a cheaper alternative poke around on Lexicanum. 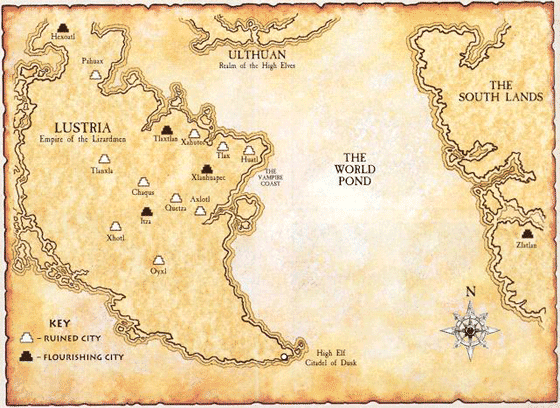 The exploration of the Warhammer world will continue in the future as there are still many lands to cover from the Empire, to Ulthuan, to the Drakwald forest and far off Cathay and Ind.